Norman K. Styer/Loudoun Now From left, Visit Loudoun President and CEO Beth Erickson, Fairfax County Economic Development Authority President and CEO Gerald L. Gordon, John Marshall Bank Loudoun County Region President Paul Bice, Loudoun County Department of Economic Development Executive Director Buddy Rizer, and Visit Fairfax President and CEO Barry H. Bigger discuss Northern Virginia's business opportunities during an April 26 forum. 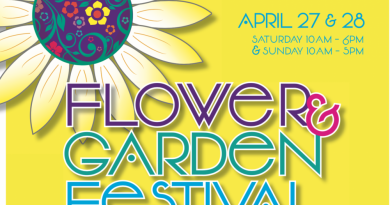 Representatives of the economic development and tourism arms of Loudoun and Fairfax counties say there’s more cooperation than competition between the jurisdiction. 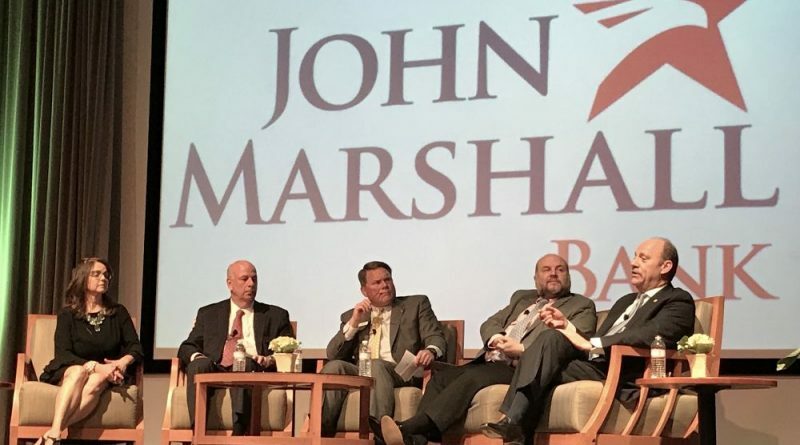 They were speaking to a crowd of business leaders during John Marshall Bank’s Bi-County Economic Summit at the National Conference Center in Lansdowne on April 26. Representing Loudoun were Department of Economic Development Executive Director Buddy Rizer and Visit Loudoun President and CEO Beth Erickson. They were joined by Fairfax County Economic Development Authority President and CEO Gerald L. Gordon and Barry H. Bigger, president and CEO of Visit Fairfax. The panel discussion, touching on the economic strengths of the region, challenges of workforce development and opportunities for venture capital investment, was moderated by John Marshall Bank’s Loudoun County Region President Paul Bice. The key takeaway from the program was a refresher on the region’s undisputed role as Virginia’s economic engine, generating 42 percent of the state’s tourism revenues and 44 percent of the commonwealth’s income taxes. All four industry representatives agreed that business prospects and visitors don’t know, or care, where the county borders begin or end. And, in large part, business leaders from each of the Northern Virginia jurisdictions work together to make the region stronger and more attractive to investment. Among the key challenges to building on that success are workforce supply and development, housing, and transportation— although, the panelists said, Northern Virginia ranks well in those areas compared with other popular markets, such as California, New York or Boston. Rizer pointed out that some of the region’s economic strengths—including low unemployment and high household incomes—aren’t necessarily attractive assets for prospective businesses. But the panel agreed that Northern Virginia has much to offer. Gordon noted that other areas of the country competing for business development have higher costs of living and higher wages and worse traffic. To expand the workforce, especially in high-tech fields, the panel pointed to the need to get the region’s well-educated high school students to return to the area for jobs after college, to expand STEM learning in kindergarten through high school, and to keep female students involved in math and science beyond their middle school years. Housing supply and affordability is a concern. A focus also has been on attracting more millennials and combatting the perception that this important component of the workforce only wants to live in the urban settings offered by Arlington and Alexandria. Gordon said that, while those areas may have the highest density of millennial workers, Fairfax is home to seven times as many—and they live closer to the county’s fast-growing high-tech companies. And he pointed to a study showing that many Arlington residents working in the IT sector commute to Tysons Corner via the Silver Line. “It is not as important as where they live as where they work,” Gordon said. While the Silver Line is an asset to the region, Rizer noted that it won’t solve the transportation problems. And as much as residents and business leaders gripe about rush hour gridlock and other challenges in the market, Gordon said the quality of life in the region clearly outweighs the inconveniences when businesses evaluate where to locate.